Degenerative discs form over time, producing irritation, low-grade inflammation, and can be a major cause of chronic lower back pain. 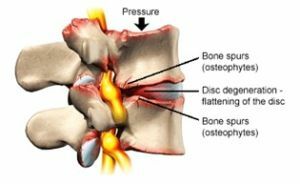 Degeneration happens when the discs in the spine do not have a dedicated blood supply; the discs must rely on a process called diffusion to receive their supply of oxygen, nutrients and water. When the flow of these elements is disrupted, the vertebral discs can deteriorate. Degenerative discs become more vulnerable to injury from physical stress and every day activities which can play a contributing role to serious conditions such as osteoarthritis, spinal stenosis and disc herniation. Contact our office at (01) 642-5911 to schedule an initial consultation to determine if your clinical case is suitable for the spinal decompression therapy. You may also bring recent copies of x-rays or MRI films or reports to help evaluate your case. After answering any questions you may have about the recommended plan, you may begin your case.